"This dramatic deep two frame mosaic depicts a rarely photographed region of the Virgo Cluster of galaxies. Both galaxies were included by Charles Messier in his 18th century collection of objects that are not comets. 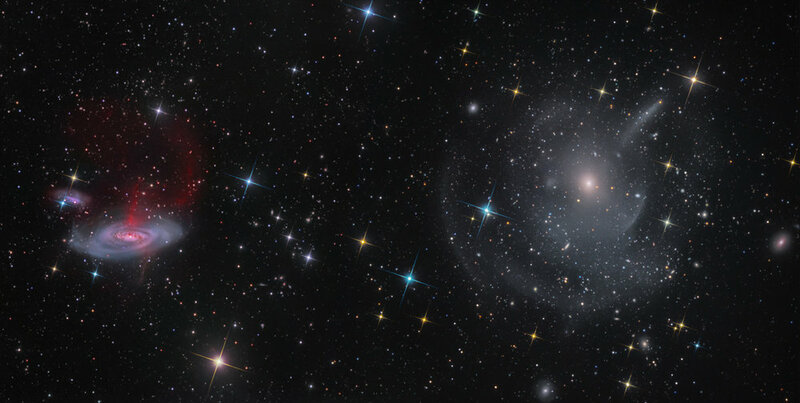 The one on the right is M89 and the one on the left is M90, both are between 50 and 60 million light years away along with the small companion of M90, IC 3583. This image perfectly illustrates the influence of environment on galaxy evolution. M90 was considered a placid serene galaxy with very little activity and a low star formation rate. Recent studies by professional astronomers show it to be experiencing ram pressure stripping, a phenomenon that is known to affect many galaxies in the Virgo Cluster and other galaxy clusters. Galaxy cluster environments contain lots of hot gas visible in x-rays known as the intracluster medium (ICM). The movement of a galaxy through the ICM creates a "wind" that exerts pressure that strips gas away from the galaxy due to it being gravitationally bound with less strength than the surrounding forces. As M90 has fallen through the Virgo Cluster toward its center, cold neutral gas has been stripped away from it thereby quenching any future star formation. The effects of ram pressure stripping on M90 are dramatically illustrated with low surface brightness tails of ionized gas revealed with deep narrowband Ha exposures, which were discovered in 2016. They have a length of 472,000 light years and currently it is unclear what the ionizing mechanism is. M89 is an unusual elliptical galaxy with a series of tidal shells and plumes revealed with long exposures. M89 was one of the first elliptical galaxies where a series of outer shells was identified in 1979 by the esteemed astronomer David Malin. This discovery was made possible through innovative techniques developed by David Malin involving enhancement and amplification of faint features on photographic plates and led to the publication of a catalogue of shell elliptical galaxies. The linear feature was first reported in 1979 to be a jet from the galaxy core but is actually a well placed tidal stream structure. The origin of the shells is not conclusive but the explanation most commonly invoked for this type of galaxy are multiple mergers with previous companion galaxies. M89 is also experiencing gas stripping but this is only observable in x-rays. Images taken with the Chandra telescope show a tail of gas, these features are a result of it also falling into the Virgo Cluster."